A former church worker and activist from the Philippine province of South Cotabato in Mindanao has been named recipient of this year's Alexander Soros Foundation Award for Environmental and Human Rights Activism. Rene Pamplona, who received the award for his years of work with tribal communities opposing large-scale mining operations, said he was "surprised and humbled by the recognition." "The award is a validation of the issues that we've been fighting for on the ground for a long time," he told ucanews.com. Before setting up the Convergence of Initiatives for Environmental Justice, Pamplona, 49, worked for the Social Action Center of Marbel Diocese. "Winning the [award] is not just recognition of my activism, it is recognition of the work of all defenders," said Pamplona, a father of seven children. His work in tribal communities brought many incidents of harassment and even direct threats to his life. According to the latest Global Witness report, the Philippines is the most dangerous country in Asia for land and environmental defenders, with at least 48 activists killed in 2017. The announcement of the award coincided with the first anniversary of the killing of eight tribal people in the province who opposed the development of a coffee plantation on their ancestral land. The massacre resulted in the displacement of at least 200 tribal people who left their homes for fear of more attacks. In a statement, the Alexander Soros Foundation said Pamplona has been chosen for his "tireless effort to seek justice for indigenous communities fighting to protect their land from large-scale mining, coal fired power plants, and agribusiness projects." 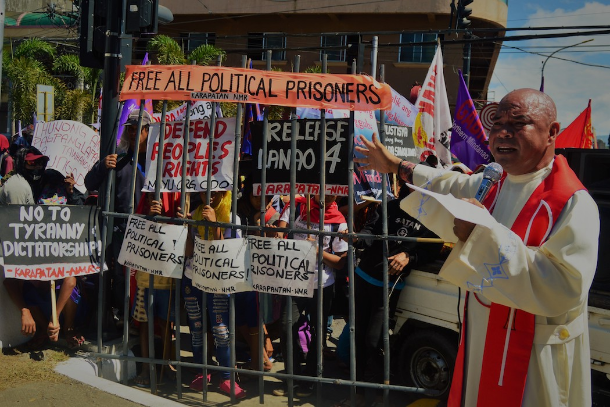 The award-giving panel said Pamplona's recognition and the telling of his story "is a beacon of hope not only for him but for all those standing up for the indigenous peoples of the Philippines."